We've been working so hard on improving our Brand Monitoring functionality that you could already call it 'Brand New Monitoring!' It remains an essential solution for tracking your brand’s online reputation on a daily basis. Today we’re happy to roll out a couple of updates that you will find extremely useful. Let’s take a look. Firstly, you can now monitor referral traffic (visits to your site that come from direct links on other websites rather than directly or from searches) from mentions found by SEMrush using Google Analytics data in Top Backlinks – the chart which shows backlinks for a selected site by number of found mentions. Find the Top Backlinks table in the Statistics tab, click on the Settings button and the wizard will then instruct you to connect your GA account. Another important feature will come in useful when carrying out a detailed mentions research. We’ve added the ability to save filter settings to the tool, so you don’t need to apply all of them every time you come back to the tool. Find the saving feature in the filters section. Please note that recently we’ve started testing two filter saving feature styles, so different users will see different versions of it. Depending to the test results, we will choose the most appropriate style. Your help is always much appreciated. That’s all for today and now you’re good to go. 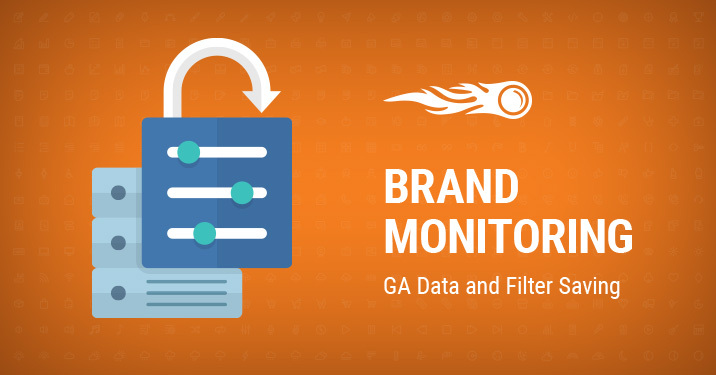 In case you still haven’t set up the Brand Monitoring tool, give it a go right now! And don’t forget to share your ideas, comments and suggestions by emailing us at [email protected].